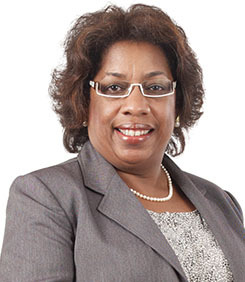 Polmae ”Pam” Thompson was appointed Chief Project Officer, Enterprise Project Management Office (ePMO), The Jamaica National Group in August 2017. She has worked as both an internal and External Consultant in several companies, both here in Jamaica and in the United Kingdom. She held the position of Assistant General Manager, I.T. Consulting Services at Management Control Systems prior to being seconded to the Jamaica National Building Society (JNBS) in 2009, assuming the position of Senior Manager in the Enterprise Project Management Office. While she leads the entity that offers project management services to the Group, particularly for strategic projects, she also has responsibility for the development of systems, policies and procedures that promote organisational efficiency at the Group. Under her stewardship, JNBS was awarded Project Management Organisation of the year, both in 2012 and 2013, by the Doctor Bird chapter of the Project Management Institute. Mrs. Thompson was also awarded Project Manager of the Year 2013 by the Project Management Global Institute-(PMGI). Additionally, in 2016, the ePMO was invited to be a contributor to an international project Management primer, A Compendium of PMO Case Studies.